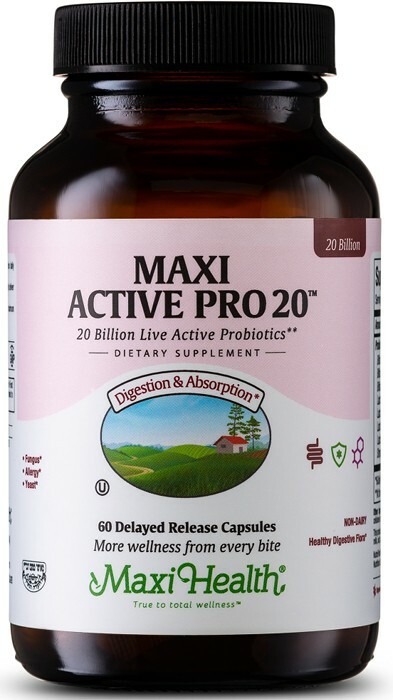 Maxi Active Pro 20™ offers you 15 probiotic strains, 200 mg per serving, in a delayed release capsule. Probiotics are live organisms (which need to be abundant) in the small intestines. They support assimilation of nutrients and infection prevention. As they become depleted, they not only cease their digestive/food assimilation function but also fail to act as a barrier. This can result in toxins passing between cellular connective junctions, into the blood stream. They thus bypass the body's normal excretory channels. This is known as leaky gut syndrome. Active Pro 20™ comes to you in delayed release capsules, enabling your probiotic to start its work in the gut where you need it and doesn’t get sidetracked or diluted in acidic environment of the stomach. That’s great news! Let the Maxi Active Pro 20™ in delayed release capsules help you! Take one (1) Maxicap™ twice daily before meals or as directed. Store tightly closed, refrigerate after opening for maximum potency. Other Ingredients: NutraFlora® scFO™ (Short Chain Fructooligosaccharieds), vegetable cellulose (capsule), magnesium stearate, dextrose. This product contains NO animal products, soy wheat, gluten, yeast, milk, salt, corn, artificial artificial flavors, or preservatives.